Due to continuous rainfall, the water flow in Jhelum has gone up to 50,000 cusecs as against the carrying capacity of 35,000 cusecs. SRINAGAR: Authorities issued a flood alert for central and south Kashmir on Saturday and advised the people in low-lying areas to remain on guard as heavy rains swelled river Jhelum and other water bodies. Three people, including a woman, died in rain-related incidents at Srinagar, Kishtwar’s Kalamsatar area and Surankote. Due to continuous rainfall, the water flow in Jhelum has gone up to 50,000 cusecs as against the carrying capacity of 35,000 cusecs. While the Srinagar-Jammu highway was closed for traffic, the Amarnath yatra remained suspended for the second consecutive day due to inclement weather. Both Baltal and Pahalgam routes were closed because of landslips and slippery tracks due to incessant rainfall, an official said. In Srinagar, low-lying areas such as Kursu, Rajbagh, Bemina, Lasjan, Zainakote were inundated. Water pumps worked full throttle to drain out excess rainwater. An official said a joint control room with support from civil, police, CRPF and Army was set up. Relief and rescue material were on standby to promptly respond to any situation. Meanwhile, a youth named Asif Ahmed, resident of Nagrota, Jammu presently living in Aloochibagh area of Srinagar drowned in a flood channel in the afternoon while trying to rescue a dog. Efforts were on to fish out his body from the water channel. Rain began in Srinagar on Thursday while other parts of the Kashmir Valley getting rain since Wednesday evening. Weather, however, improved partially in Saturday late afternoon after it stopped raining. Shopian, Anantnag and Srinagar districts received 53 mm of rainfall for last three days. The water level rose above the danger mark at Sangam in South Kashmir, and it continues to rise at Srinagar’s Ram Munshi Bagh. The water level stood at 22.87 ft at Sangam and 20.96 ft at Ram Munshi Bagh. Flooding is declared at Sangam when the water level is 21 ft and 18 ft in Srinagar. The people living in low-lying and vulnerable areas were advised to remain prepared for evacuation. 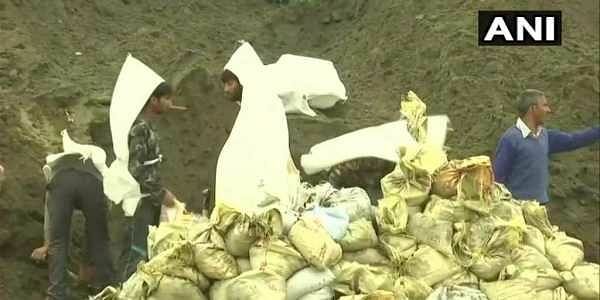 At many places in Srinagar and south Kashmir, the people assisted by the administration placed sand bags on the embankments of Jhelum and streams at vulnerable areas to prevent breach along the banks. Director, Metrological department, Sonam Lotus told TNIE that dry weather could persist in the Kashmir Valley on Sunday. "However, there are chances of rains at some isolated places". Lotus said the flood threat would remain for next 12 hours. The Valley would receive rainfall again on July 2 and 3, he added. In September 2014, the Kashmir Valley was drowned by massive floods that claimed about 300 lives and damaged properties worth several hundreds of crores.